“Hindsight is the most powerful teacher” – so my parents said and it’s so true when it comes to starting a business. 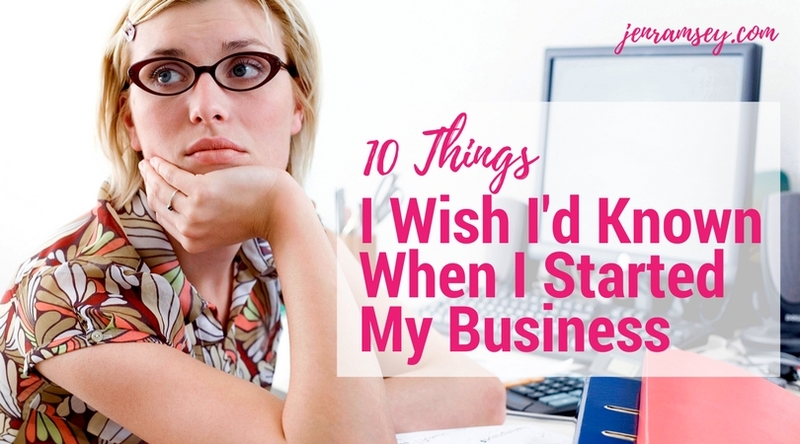 So this week I wanted to share with you 10 things I wish I’d known when I started out in business. If you’re looking to start a business, or you’re feeling stuck in your business right now – feel free to borrow some of my hindsight. Starting a business is one of the most exhilarating experiences we can have. It can also be exhausting. Reading this post might save you hours, weeks or months of time and effort. In business time literally, means money. When I look back at the time I spent on my business card and logo I want to either laugh or cry. Believe me, I’m a highly visual communicator so I felt this stuff was sooooo important at the time. Don’t get me wrong these things are important – but looking back I feel like I took too much precious energy out of my “business energy bank” … on those couple of decisions when the energy could have been much better spent on other important decisions over the many weeks and months that followed as I went about starting my business. So if you want to be more successful – spend time on the most important things (the 5% that will help you generate more traffic, leads, and income) and make decisions more quickly on the smaller less important things. Instead of spending time with my logo I needed to spend more time with my audience to really build a brand they loved and would relate to. The problem was I felt too shy and concerned that I didn’t know enough to be able to talk to them! Aaagggghhhhhhh!!!!! I would love to take my time back over again. Do what you need to do to get to know your audience and do it as soon as you can. Once you get to know your audience ask them what they want so you can create products and services they will buy. This is the key to generating income quickly. Knowing your audience will make you feel so much better about what you’re doing in your business. When your audience becomes real to you – you’ll feel what you are doing is real. When you have real conversations they’ll tell you what they want and what is bothering them most. This step is literally the key to personal fulfillment and income in your business. You’ll feel better about what you are doing and the fear of “selling” to people will start to fall away. Early on in my business, I felt that I couldn’t bring to the table all of the things that mattered to me. I strongly believe in the power of mindfulness, meditation, and self-love as key tools to business success … but I felt that people might judge me if I shared these thoughts and tools. Ironically as soon as I started to talk about these things and made them a part of my brand – everything changed. The people I wanted to work with started being attracted to come and work with me. So if you’re starting a business, or you’re feeling stuck in your business maybe there’s something missing. Is there something that truly fires you up that isn’t a part of your business right now? What could you do to bring it into your offering for your audience? Take a moment and listen to that quiet voice inside that would love to be a part of what you are offering to the world! If I had my time over again I would also make an offer to my audience sooner. The fact is you can’t make an offer until you are clear on your audience and what they want (point 2) and what you truly want to do in your business (point 3). So work on these two things and the offer you make will become much more clear to you. If you want to know more about your audience, you’re not sure about how to get aligned with your business or what offer to make then join me on my Facebook group Fearlessly Authentic, Focused and On Fire with Jen Ramsey where you’ll gain lots of tips and strategies to build your business. I had a couple of false starts so I held off building my list until I thought felt things were “good enough” to put out there! Another aaaagggghhhh moment! If you’re clear on your audience and what you want to say take the time now to start building your list by creating interesting content that people will want to subscribe to. A simple lead magnet or opt-in that answers a problem your audience has is the easiest way to do this. Join me on my Facebook group if you want to do this. Wherever your audience is – be it Facebook, Instagram, Pinterest or Twitter go there and get to know how it works. This is critical when you’re starting a business. You need to go where your people are and hang out with them. Facebook is fantastic – with Facebook groups, you can really start to reach out and help people in a way that is authentic and real. You can start conversations and get to know people well in a surprisingly short space of time. If you’ve read this far you’ve probably worked out I’m a recovering perfectionist!! That’s been an underlying mindset issue that I’m here to tell you is not good for business – especially when you are starting a business. From my experience, NOTHING happened until I put myself and my material “out there.” Has everyone loved it? No … but do I have new clients and do I have a business that’s running successfully? Yes … all because I said let’s do this thing and get it out there. There are times of the day that works better for us creatively than others. For most of us, it’s the mornings. Things changed for me when I started to block out two to three hours every morning for me to do the creative work I need in my business. This meant no meetings, no Facebook or email notifications … or phone calls. If you take regular time like this you’ll be amazed at what you can get through. This step works on the principle of “cognitive ramping” meaning that it takes time to “ramp back up” into full creative mode every time we’re interrupted. Given these creative times are only ever 2 to 3 hours in length, clients and contacts are ok with me returning calls after my creative time. When you take these creative slabs of time it’s also important to take breaks every 50 minutes or so to help keep yourself fresh. I also use a productivity music tool called Focus@Will to help keep my brain focused and concentrated. I felt like I’d been walking in the mud until I got some good practical help in my business. Things really took off when I engaged a Virtual Assistant to help me. She is an angel and allows me to do the things I’m best at. We meet regularly and the whole energy of the business moved to another level. We’re achieving so much more – what would have taken me 6 months took only 3 months as a result of her help. The other critical support for me has been my mastermind group. The wisdom, support and practical feedback of the four other women in my group has propelled me forward incredibly. I can’t speak highly enough of this group in terms of keeping me accountable and on track. If you’re not part of a mastermind I encourage you to find one as soon as you can. The power of meditation and intention setting has also been unbelievable for me. My morning rituals of meditation, gratitude, and intention-setting support me in a way that is very personal and powerful. It is my time to get clear and grounded and centered for the day. As I come from a background where “big-noting” yourself was not encouraged I’ve really had to climb some internal mountains around what success as a woman means, looks and feels like for me. Now I know “success” is not a dirty word but something that can live alongside authenticity and connection and help people I focus on what this means for me every day. If you’re just starting a business, or if you’re feeling stuck, then I promise meditation will help get you moving again. Want some help to grow your business? 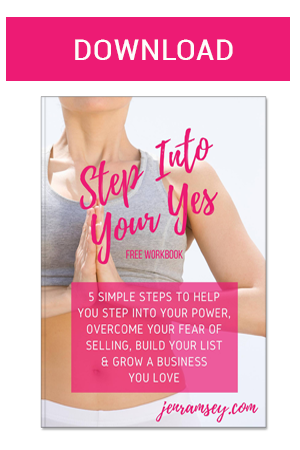 If you’re starting a business, or have been in business for a while and feel stuck, and you want to avoid the issues I’ve discussed here join me on my Facebook group Fearlessly Authentic, Focused and On Fire with Jen Ramsey where you’ll gain lots of tips and strategies to build your business. This Facebook group is for people who are heart-centered and want to make a big difference in the world but are feeling a bit stuck! For more information visit facebook.com/groups/fearlesslyauthentic or email me at hello@jenramsey.com. If you’d like to learn more about working with me click here. Until next time, take care and lots of inspired action! Time for a “Relationship” Check-Up? Are You Running Your Business or is it Running You? If you continue to use this site we will assume that you are ok with our terms.